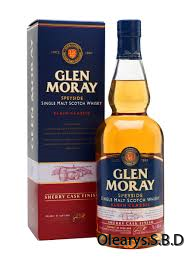 Glen moray sherry cask speyside single malt. Nose: Raisin and milk chocolate, with a backbone of butterscotch sweeties. Palate: Cinnamon starts to develop on the palate, giving it an enjoyable warmth. Still rich in caramel and butterscotch.